A combination of beneficial attributes across a diverse industrial and geographic landscape has made Canada a global economic leader and attractive place to invest. Canada’s economy continues to rock. By just about any standard, Canada’s economic performance dominates the G-7 and the G-20, thanks in part to its economic diversification. Not only is Canada well-known for its traditional industries of mining, energy, lumber, agriculture, and fisheries, but its knowledge-based sectors like biotechnology and life sciences, nanotechnology, advanced manufacturing, information and communications technology (ICT), and aeronautics have gained international reputations as well. Why does Canada have such a track record of success? The biggest factor is the Canadian government’s commitment to create a fertile business climate that is supported by a number of competitive advantages, such as low business costs and corporate tax rates, a highly skilled and educated work force, strong R&D incentives, and a stable banking environment. When integrated together, these advantages create a climate that supports innovation, business growth, and diversification. Robust, long-term public-private partnerships among federal and provincial governments, academic institutions, and private-sector companies have resulted in the development of strong industries that are achieving change on a global level. *Standing among G-20 countries. Rankings based on the following eleven categories of quantative and qualitative indicators: trade freedom, monetray freedom, property rights, innovation, technology, red tape, investor protection, corruption, personal freedom, tax burden and market performance. Corporations want to invest in a country that has a solid track record of fiscal stability and reasonable, predictable economic management — which starts with government. Canada is one of the most financially stable countries in the world. 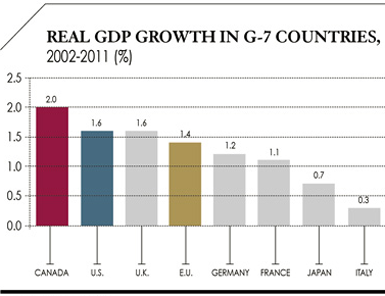 With the lowest debt-to-GDP ratio in the G-7 in 2011, Canada expects to hold this leading position through the 2012–2013 forecast period. For the fifth consecutive year, the World Economic Forum (WEF) has declared Canada’s banking system to be the soundest in the world. This was also proven by the Great Recession — during the financial crisis, not a single Canadian bank or insurer failed, and none required bailouts. In addition, according to Global Finance magazine, six of the top 10 safest banks in North America are Canadian. Standard & Poor’s has also reaffirmed Canada’s AAA credit ratings — all of which confirm that it’s very hard find a better place to invest business capital. As indicated by the Organization for Economic Co-operation and Development (OECD), Canada’s work force is one of the most highly educated in the world, with half its working-age population holding at least a high-school education. Canada also has the highest percentage of individuals achieving at least college or university education among OECD member countries. The overall skill level of Canada’s work force is also tops. For example, the availability of qualified engineers in Canada is the highest in the G-7, according to the Institute for Management Development (IMD). A highly skilled work force is a big reason the ALTEN Group — a French engineering firm that specializes in aerospace, telecommunications, life sciences, and auto manufacturing — decided to establish its Canadian headquarters in downtown Montreal, with plans to create 200 high-tech jobs within three years. Canada also does a great job of creating a leadership pool to manage its talented workers — the WEF ranked Canada second in the G-7 for the quality of its management schools. Six Canadian schools of management are also ranked among the top 100 in the world according to the Financial Times (UK) Global MBA rankings for 2013. 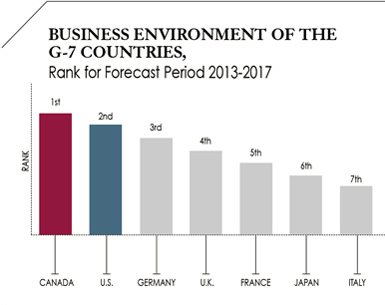 In addition, according to a study that measured the extent to which management education meets the needs of the business community (World Competitiveness Yearbook 2012), Canada ranked first in the G-7. Canada’s overall tax rate on new business investment is substantially lower than in all other G-7 countries. According to Forbes Publishing, Canada was highly ranked in a number of categories, including the amount of red tape involved in starting a business (third place) and investor protection (fourth place). Canada ranks first among the G-7 and OECD countries for the lowest number of procedures required to establish a new business. The Economist Intelligence Unit (EIU) (February 2013) ranked Canada highly for its infrastructure, market opportunities, low tax rates, and foreign trade and exchange controls. Canada currently offers one of the most favorable tax treatments for R&D among the G-7 — especially for biotechnology, pharmaceuticals, and advanced manufacturing. Canada provides a system of tax credits and accelerated tax deductions for a wide variety of R&D expenditures. Eligible costs include salaries, overhead, capital equipment, and materials. These tax-based treatments allow companies to significantly reduce their R&D costs through direct investment or sub-contracting in Canada. The nation’s generous R&D tax incentives save companies, on average, 30 cents on a dollar invested in R&D in Canada. R&D-intensive sectors also enjoy the lowest costs in the G-7, these being about 10 percent lower than in the United States. Angiotech, a pharmaceutical and medical device company founded in 1992 by then-medical-student William Hunter, can attest to the support of the National Research Council’s Industrial Research Assistance Program (NRC-IRAP) in helping his company turn scientific ideas into groundbreaking treatment solutions — including a product that has been implanted in over four million patients in the world. “The role of the Canadian government in supporting private-sector research through programs such as the NRC-IRAP is extremely important for supporting our culture of innovation,” says Angiotech’s CEO Hunter. In a move that further confirms this deep belief in assisting high-tech startups, Prime Minister Stephen Harper recently announced a new initiative called the Venture Capital Action Plan that will help high-growth companies access venture capital to build their businesses and create jobs. The plan includes $400 million to help increase private-sector investments in early-stage risk capital, and to support the creation of large-scale venture capital funds led by the private sector.